The client wanted a sophisticated open-plan family space that they could enjoy with the kids during the day and use to entertain family and friends in the evenings. The husband is originally from Scotland so some cultural references in the design were important. 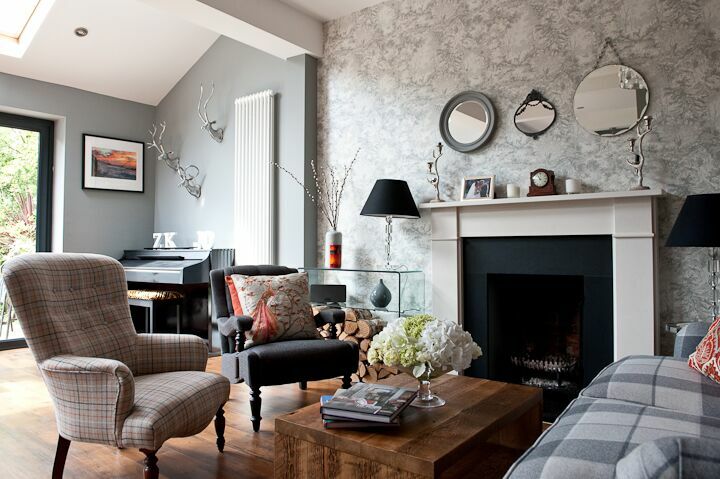 We went for a confident battleship grey on the walls to contrast with the white kitchen and give the room more depth and warmth, used stunning Mulberry wallpaper on the fireplace wall, and introduced the modern take on tartan on the sofa. Orange was chosen as the accent colour to lift the whole scheme and keep it from being too bland and cold. The client’s old armchair, a charity shop find, was given a new lease of life with Romo fabric.